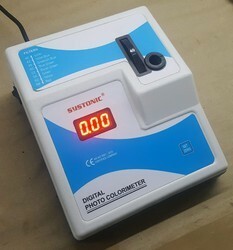 Providing you the best range of auto colorimeter s-912, digital colorimeter s-910, digital photo colorimeter s-9121, fully automatic colorimeter s-9120 and microprocessor photo colorimeter s-916 with effective & timely delivery. 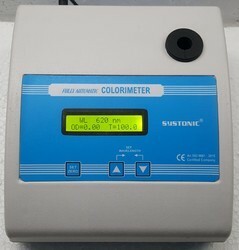 We are experienced manufacturers and suppliers of Auto Colorimeter for our clients based globally. Manufactured with excellent raw materials and technology, they are properly customized and are available in multiple designs. Apart from this, we deliver our products on time. They are also useful for analyzing chemicals & blood. Features consist of : Accurate and direct readability of absorbing levels Rugged, Reliable & easy operations Consists of a long lasting photo diode detector 1 ml sample size Battery/Mains operated Perfect durability . 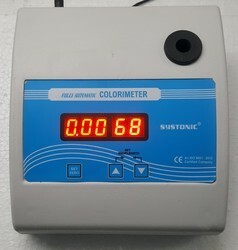 Microprocessor Photo Colorimeter - 916 is a compact and easy to operate instrument for Photo Colorimeter analysis of any concentration. 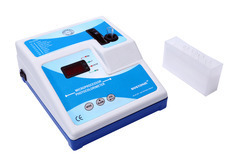 The output is available on a 3 digit seven segment red LED display in terms of %Transmission (%T), Absorbance (Abs. ), and Concentration (Conc.) and KFactor. This is a unique system that combines convenience with accuracy and precision in analysis. The instrument includes a wide range of filters covering wavelength from 420-680 nm in the form of in-built filters. The filter setting is controlled by a rotating disc. An in-built shutter control is provided to avoid fatigue of photodiode. When the instrument is switched on, Lamp glows and light passes through the solution to the detector and absorbance or %T measurement is taken. Light source is pre-focused tungsten lamp. The instrument confirms to all general & safety standards. Features: %T, Abs, Conc. 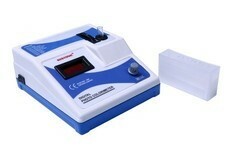 K Factor 1 ml Sample Volume Auto Zeroing Facility Highly Stable & Accurate Range 400 to 700 nm Soft Touch Membrane Keys.